OF THE people. For the people. By the people. That is the ethos of the Western Corridor NRL bid that is hoping to be given a licence should the game expand in 2018. The constitution of the new NRL team - to service Ipswich, Logan, Toowoomba and the country areas to the west - allows individual members of the community to own the club, as is the case with the Green Bay Packers in the American NFL. Western Corridor bid chairman Steve Johnson said this meant the people of Ipswich could own a stake in the club and the class of shares made available would enable them to have a genuine say in how it was run, including the appointment of directors. "Most rugby league clubs offer memberships, but in the main that means they are a season ticket holder," Johnson said. "They have no say in the club and no control. "But in our model the public can buy a share in the club and having a meaningful say and vote in the club. "There are certain things in the constitution that the club can't change without the majority consent of all members. "They include our playing base, where we train from, the colours of the side, the name of the side and some of the community things we put in place that ensure we are anchored in the grassroots. "Because it is a start-up club there has to be some control around the board, so you don't have people trying to overthrow the club at the start and wreck its vision, passion and ambitions. "But it is going to be a rugby league club owned by the people. "Those initial shareholders will receive ongoing benefits as the club moves forward." 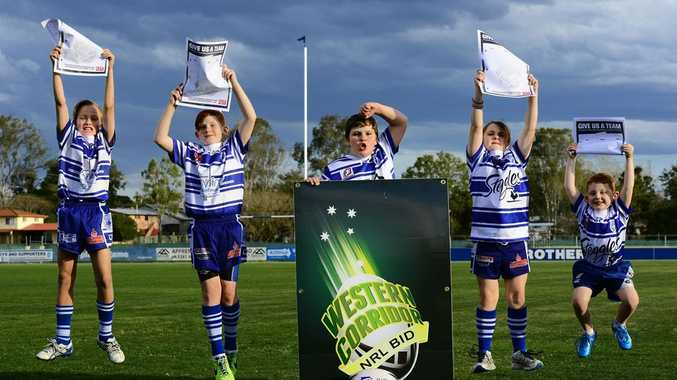 The Western Corridor NRL club will be not-for-profit. The plan is to raise the initial start-up costs by offering shares to thousands of supporters, to be supplemented by payments from sponsors and benefactors. The Packers' website states that the "Green Bay Packers Inc has been a publicly owned, non-profit corporation since Aug 18, 1923, when original articles of incorporation were filed with Wisconsin's secretary of state". It also shows how fans have supported the team financially through five stock sales: 1923, 1935, 1950, 1997 and 2011. Today 352,427 people own 4,738,027 shares in the franchise. "The Green Bay Packers serve a community of just over 100,000 and are one of the franchises that have never been moved and relocated because the community believe it is their team," Johnson said. "They work hard on their community-based model, and every time they have needed further funds they raise funds by share issue. "For us in the Western Corridor it is important our side represents the community, and to do that you have to be owned and controlled by the community and embody its values and ideals. The club will have its training base at Brothers Leagues Club. Brothers are one of the leading clubs in the region in senior and junior league. Brothers junior coaching and development director Jason Connors said he was "definitely keen to see an NRL club being formed out here". "The people want it," he said. "Rugby league is the main sport being played by kids in the western corridor, by far. "This bid provides a pathway for kids to play rugby league in their home town. "They will get to stay here in the area, instead of going down south. The support is here." Connors said the community-based model would ensure "fans have more of a say". "The members know what they need and what they want, and the mad supporters out there will buy tickets. "It is a win-win for them. "The Green Bay Packers do the same thing. The fans feel like they have a piece of the club, rather than one owner owning it." Petitions will be available to be signed at Ipswich Rugby League finals at the North Ipswich Reserve tomorrow and at the Briggs Road Sporting Complex for the Ipswich Junior Rugby League finals today.